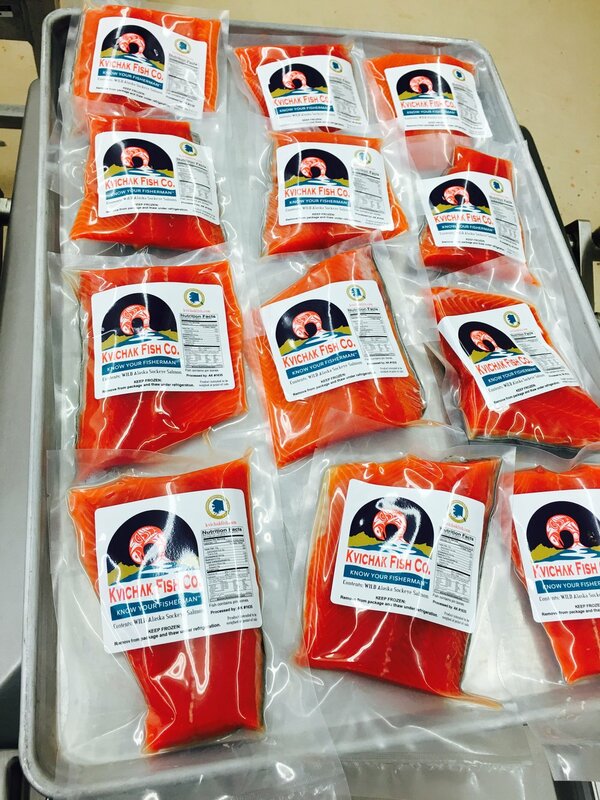 Wild Salmon Products — Kvichak Fish Co. The Kvichak Fish Co. brand. Do you know your fishermen? We do. The best way to guarantee your freezer is full for the year is to get on our list before each summer when we go up to to Alaska. Free delivery to your home in August. We take orders by phone, 1-406-490-4898 and email at kvichakfish@gmail.com. Contact us anytime! Farmers Markets in and around Montana are our very favorite! We love seeing our old pals and making new friends! We will keep you posted on where we are selling each weekend throughout the year. Fall is salmon smoking time in Montana. We utilize the Mission Mountain Food Enterprise Facility in Ronan, Montana to smoke up a delectable supply of hot-smoked cutlets just in time for the holidays. Order by calling 1-406-490-4898 and we will ship anywhere in the United States to you and yours. Smoked Salmon can be ordered in fillets and portions. Flash frozen, blast frozen, whatever you want to call it. Our products are taken from the nets, live-bled, put on slush ice, cut, packaged and frozen at -35 F within hours of being caught. This ensures that the fresh quality of the fish is maintained until it reaches your kitchen. This premium, firm, red fish is truly frozen in time and it shows in the presentation. Kvichak Fish Co. Salmon is second only to traveling to Bristol Bay and catching it yourself! A classic Alaskan dinner, this halibut has been called, Supreme..Out of this World...Amazing...We call it fresh! 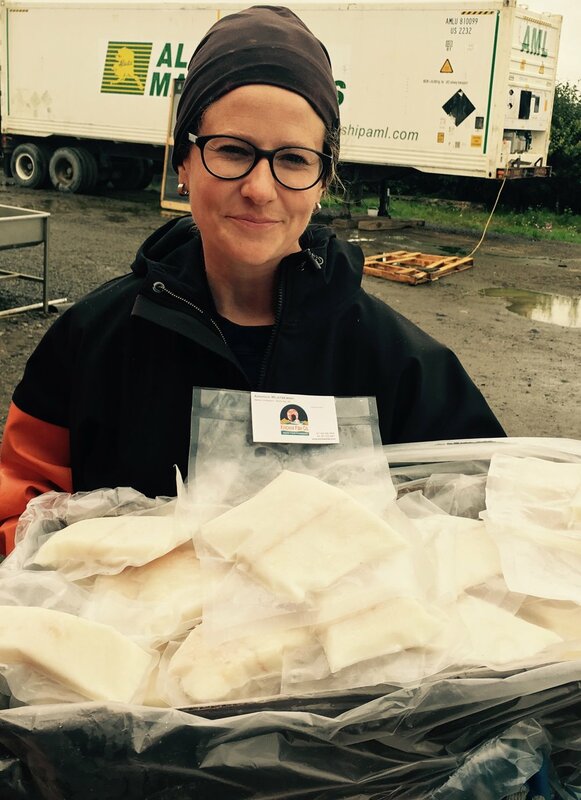 From the F/V Akira Brooke II, this halibut is right off of the boat and into the freezer. Our customers cannot wait for us to get it home! Next to the large processors, we are a small fish. But this speaks volumes for the quality of our salmon. Working with only a few fishermen and in small loads means that we can put the time into the details that result in the best quality product possible. Our fish don't wait for days in a fish hold to be pumped through processing machines with thousands upon thousands of pounds of fish. 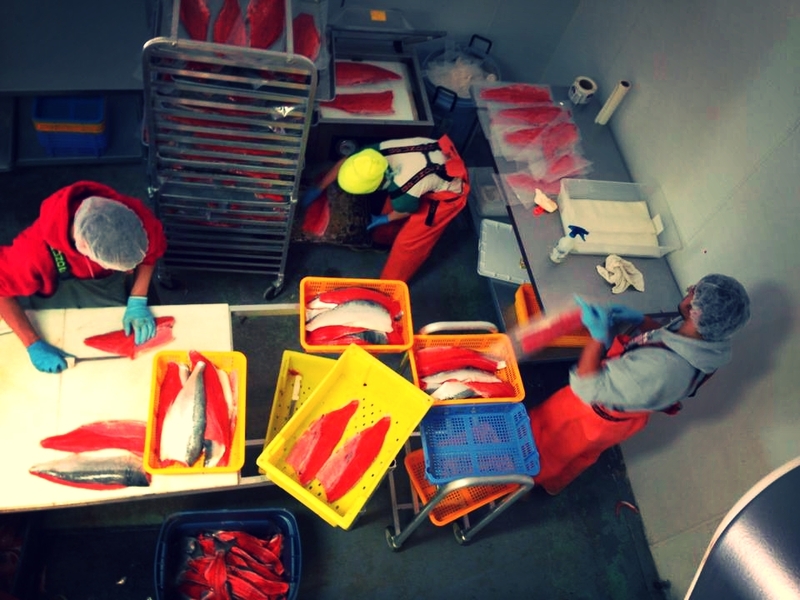 Our crew hand-fillets and packages each fish- giving a high-yield, high-grade cut of salmon. A real slab. Our ground salmon burger, smoked salmon and halibut ...a peek into the chest freezer at the Farmers' Market. You can order your salmon by the pound or by the 45lb case...in PORTION or FILLET. We sell our salmon retail or at a wholesale price so get your friends, relatives and neighbors together and join our Buyers Club. We use Alaska Air Cargo to ship your case to the nearest airport direct from Alaska, and are happy to arrange a delivery to our Montana customers right to your door.